ScoopFree® is the original self-cleaning litter box you can leave alone for weeks at a time. It is the only self-cleaning litter box that uses disposable litter trays to provide hands-off convenience and unbeatable odor control. Your cat will always have a clean, fresh-smelling litter box, and you’ll enjoy a home that’s effortlessly odor-free. ScoopFree® is the original self-cleaning litter box you can leave alone for weeks at a time. It is the only self-cleaning litter box that uses disposable litter trays to provide hands-off convenience and unbeatable odor control. Simply plug in the box and watch it work. The automatic rake system sweeps waste into the covered compartment 20 minutes after your cat uses the litter box. Safety sensors will detect if your cat re-enters the box and the 20-minute timer will reset. The box uses a special crystal litter, packed in a convenient disposable litter tray, that’s 5 times more effective at reducing odor than clay or clumping litters. Your cat will always have a clean, fresh-smelling litter box, and you’ll enjoy a home that’s effortlessly odor-free. ScoopFree® is the self-cleaning litter box you can leave alone for weeks at a time. Simply plug in the box and watch it work. The automatic rake system sweeps waste into the covered compartment 5, 10, or 20 minutes after your cat uses the litter box. The timer will reset if the safety sensors detect that your cat has re-entered the box. The health counter lets you track how many times your cat has used the litter box to quickly identify possible health problems. 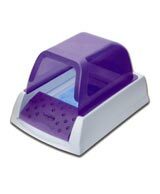 The special crystal litter, packed in a convenient disposable litter tray, is 5 times more effective at reducing odor than clay or clumping litters. The privacy hood helps keep the litter in the box. Your cat will always have a clean, fresh-smelling litter box, and you’ll enjoy a home that’s effortlessly odor-free.